With the end of the Civil War, most of the nation outside the deep South saw the resumption of a period of rapid industrialization which coincided with a surge in immigration and the nation's territorial expansion. The network of railroads which had begun in the 1830s expanded to connect the former frontier lands in the West, highlighted symbolically by the opening of the first transcontinental railroad in May 1869. Railroad mileage tripled between 1860 and 1880, and tripled again by 1920, creating a national marketplace and sparking a boom in coal mining and steel production. Technology advances in manufacturing, coupled with economies of scale from large factories, contributed to increases in productivity and a decline in the price of goods which improved living standards. New inventions, such as the electric light bulb and the telephone, or improvements in existing processes, as in the making of steel and the mining of coal, also fueled the growth. Agricultural productivity gained through efficiencies from the introduction of new machines in cultivation and harvesting, larger-scale farms and the extended use of fertilizers produced by the chemical industries, giant banks and other financial firms evolved as influential economic and political forces. Real wages in the U.S. rose 60% from 1860 to 1890, but the overall increase masked the struggles of those at the bottom of the economic ladder. In some cases, the mechanization of manufacturing replaced low-skilled workers altogether; in others, it relegated them to repetitive tasks which could easily be performed by many, including children. In 1873, Mark Twain published his book The Gilded Age: A Tale of Today, in which he satirized the ostentatious displays of wealth by a few while millions worked long hours to meet basic needs, comparing it to the process of gilding an object with a thin layer of gold to hide the core of a baser metal. Twain's phrase "Gilded Age" was used by later historians to label the period loosely from 1870 to the turn of the century. In 1890, 11 million of the 12 million families in the U.S. earned less than $1,200 per year; of this group, the average annual income was $380, well below the poverty line. New immigrants crowded into larger cities, packed tightly in tenements prone to the rapid spread of diseases like diphtheria and typhus. Corporations grew in size and scale, particularly in such key sectors as the railroads, steel and oil refining. To finance the expansion, giant banks and other financial firms evolved to support an economy increasingly dominated by a small number of giant corporations, which often were accused of predatory practices to eliminate their competitors. Toward the end of the century, the sharp divisions in wealth brought increasing calls for social and political reform. Workers organized to advance their interests, but their earliest efforts often were blocked by an alliance of management with political leaders. In 1892, after failed negotiations for a wage increase, 3,800 workers were locked out from the Homestead steel mill near Pittsburgh owned by the United States Steel Co. controlled by Andrew Carnegie; when Pinkerton security guards called in by plant management were assaulted and beaten by the workers, the governor of Pennsylvania ordered 8,500 National Guard troops to seize control of the plant, breaking the strike. With the union crushed, the plant hired new workers, slashed wages, imposed twelve-hour workdays, and eliminated 500 jobs. 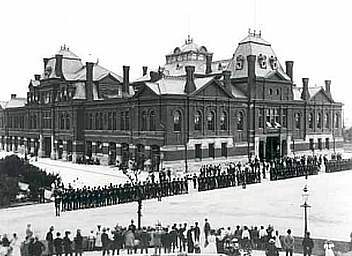 Two years later, workers protesting cuts in their wages by the Pullman railroad car manufacturing company, joined by members of the American Railway Union, refused to work on any trains which included Pullman-owned cars. Some 250,000 other railroad workers supported the strike, effectively shutting down train traffic to the west of Chicago. But the strike collapsed when President Grover Cleveland sent 12,000 federal troops to Chicago on July 6, 1894, with violent clashes resulting in thirty strikers being killed and millions of dollars in property damage. 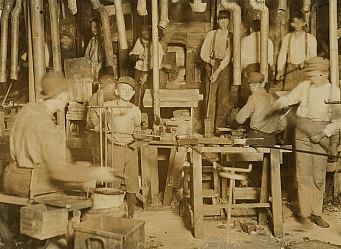 Despite the early failures, the attention focused on the demands of labor for better wages and working conditions later helped promote pro-union sentiment in many areas of the country, particularly in urban centers with high numbers of immigrants where unions were able to demonstrate the ability to organize their members to elect candidates advancing their political agenda. Political parties and bosses used this voting base to pursue their own goals, often by aiding immigrant families with practical assistance in jobs, housing or other benefits, but also fostering a climate of corruption in which influential politicians prospered. Around the turn of the century, the Gilded Age was succeeded by the Progressive Era, a label applied to the broad and disparate attempts up to World War I to address economic and social reform. The Progressive name derived from forward-thinking or "progressive" goals which its supporters sought to advance. The movement included advocates in both the Democratic and Republican parties, as well as members of third parties focused on specific issues. Women often led efforts to establish and improve public schools and curb drinking, as well as pursuing their own goals for the vote, for divorce and access to higher education and the professions. 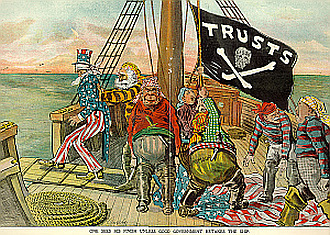 Several of the concerns targeted by the Progressives were direct or indirect results of the surge in immigration and industrialization; in the single decade from 1900 to 1910, 8.8 million immigrants entered the United States, many of whom came from nations, ethnic groups and religions which contrasted with the traditional origins and backgrounds of immigrants to America. Progressive, so-called "muckraking" authors and journalists also played key parts in highlighting specific economic and social ills which led to government action. Jacob Riis exposed the poor living conditions of the tenement slums in How the Other Half Lives (1890), helping enactment of legislation establishing minimum safety and housing standards in tenements. In The Shame of the Cities (1904), Lincoln Steffens described the rampant political corruption in the party machines of Chicago and New York serving the interests of businessmen who sought government contracts and special privileges. Upton Sinclair's novel published in 1906, The Jungle, traced the exploitation of an immigrant family and the unsanitary practices prevalent in Chicago's meat packing industry, which contributed to the approval in 1906 of the Pure Food and Drug Act and the Meat Inspection Act, the first laws to set minimum standards for food and drug production. 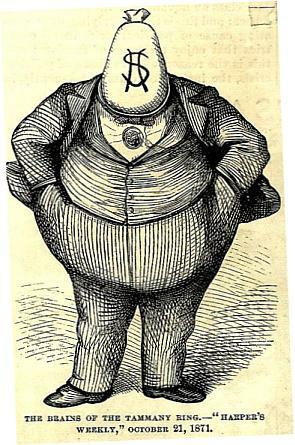 The cartoonist Thomas Nast, featured often in the pages of Harper's Weekly, frequently targeted political corruption, particularly that which flourished in New York City under the direction of Boss Tweed of the Democratic Tammany Hall machine. Progressive political leaders included Wisconsin Governor and Senator Robert M. La Follette, who sought to weaken the control of political machines and promote wider citizen participation in the electoral process. In several states, particularly in the West, progressive reformers advocated forms of direct democracy, such as authorizing citizen groups through "Initiative and Referendum" to propose new laws or to review the actions of legislatures by obtaining sufficient citizen signatures on petitions to allow voter referenda on specific issues. In 1898, South Dakota became the first state to amend its constitution to provide for popular initiative and referendum for enacting and rejecting statewide legislation. Progressives also successfully lobbied for the direct election of U.S. senators by the voters enacted through the 17th Amendment to the Constitution ratified in 1913, replacing the former system by which members of the Senate were elected by each state legislature. Reformers in many states also pushed through systems to allow for the recall of elected officials. Perhaps the most prominent Progressive was Theodore Roosevelt, the vice president who ascended to the presidency in 1901 at the age of 42 following the assassination of President William McKinley. A member of a wealthy, aristocratic Dutch family, Roosevelt broke from the pro-business policies of of his own Republican Party and targeted monopolistic business practices for reform. During Roosevelt's Administration, over forty major corporations were sued for antitrust or price-fixing violations and he took pro-labor positions in intervening to settle major strikes. Roosevelt left the presidency in 1908, succeeded by his vice president and hand-picked successor, William Howard Taft. Roosevelt later split with Taft, however, claiming that the Republican Administration had departed from the progressive course to align itself again with big business interests. 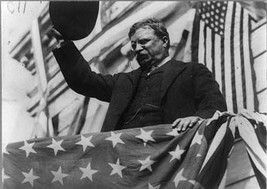 When he failed to defeat Taft for the Republican nomination in 1912, Roosevelt ran an independent campaign under the Progressive Party, popularly known as the "Bull Moose" party after Roosevelt's boast that he was "fit as a Bull Moose" to run for the presidency. But the division of the Republican vote insured the victory of the Democratic ticket headed by New Jersey Governor Woodrow Wilson.